Stoneleigh Cricket Club hosted a Warwickshire match in 1872. This is officially recorded in the Warwickshire County Cricket Club’s records. The WCCC was actually officially founded ten years later in 1882 a few miles from Stoneleigh Abbey at the Regent Hotel in Leamington Spa! 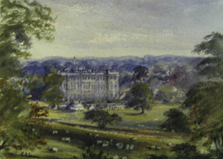 The Fourteen Gentleman of Warwickshire played the infamous I Zingari at Stoneleigh Abbey on the 5th September 1872 as part of the week’s celebrations for the coming of age of the Hon. Gilbert H.C. Leigh, eldest son of Lord Leigh. The cricket match was the highlight of the week’s festivities at Stoneleigh Abbey which included ‘illuminations, fireworks, feasting and frolics. Gilbert was invited to play for the I Zingari which was captained by his uncle Edward Chandos Leigh and included his uncle ‘Jimbo’ Leigh. Hon. Rupert Leigh his brother played for the Gentleman of Warwickshire. As was the usual format for cricket matches, the game was played over two days. On the second day though the match was postponed for two hours whilst the cricketers had a pony race! 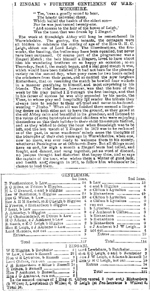 The match report describes the events on and off the pitch with typical flowery prose from the pen of John Lorraine Baldwin, a founder member of the I Zingari who detailed all of I Zingari’s matches from it’s formation in 1845 till his death 50 years later! These reports, paintings, prose, poems and postcards are beautifully bound and can be found at the MCC library. For Edward Chandos Leigh this was to be one of his last matches for the I Zingari. He had returned home to where he had started his cricketing career at Stoneleigh thirty years earlier.